I love this! It’s clever, functional and artsy all at the same time! Is it yours? It’s outside a sustainable goods store on Maine Street in my town (that’s how we spell Main Street around here). They also have decorated buckets and other recycled containers that they’ve planted all kinds of veggies and herbs in on the sidewalk. I’m thinking of doing something like this and hanging it on the side of my garage. It’s about the only area that is south facing. And we have very little yard to work with. It is! I took this photo, but you can see other photos of their creative container gardening on their Facebook page – https://www.facebook.com/ShiftofMaine. Very attractive – and as Cynthia says artistic too. I know. I like how they angled a couple of the coffee cans! I wouldn’t ever have thought of that! It’s very clever. I know, right? 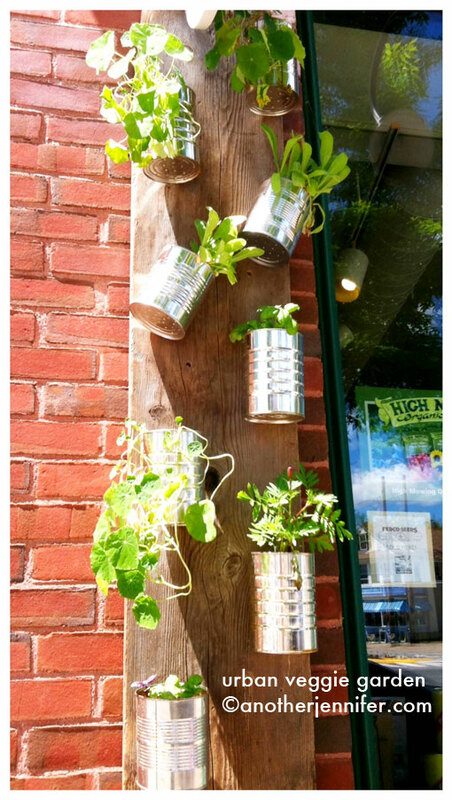 All you need are some old coffee cans, spray paint and a board to fasten them to! Thanks for stopping by! Hi Jennifer, this is another Jen ! I was just visiting Jenn at So This Is Love and she was commenting on her blog that your blog is wonderful and she suggested we come visit you. Just what you need right another Jennifer!? Love your picture, very cute and just as clever. Would be wonderful for colorful little flowers and herbs maybe some little chilies . Might have to steal the idea for my back porch next season just to be different. Hi Jen! See why I call this blog another jennifer?! So nice of Jenn to invite people to visit me. Very cute! I would worry that it would dry out too quickly in my high desert climate. We don’t have that problem here in Maine!